Most of your action figures are probably based on superhero characters from comic books, so why shouldn’t they be able to enjoy the same stories that brought you so much joy? Now they can, or can at least be posed to look like they are, with this tiny DC Comics spinner rack from Cryptozoic Entertainment. 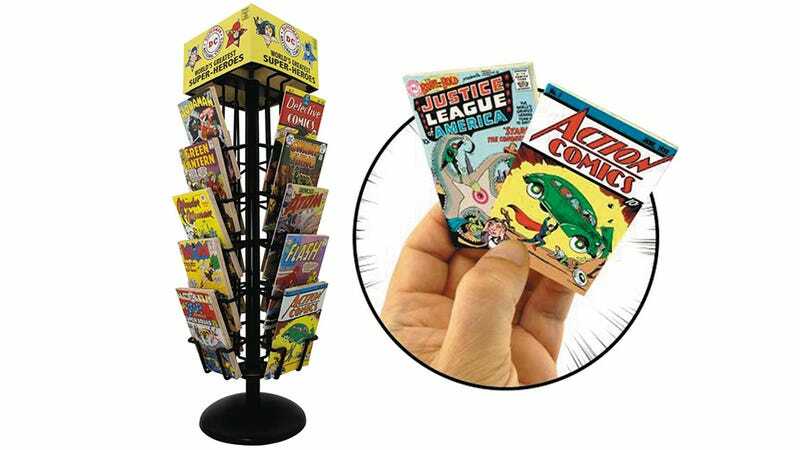 It won’t be available until December, but for a mere three bucks this spinning rack will hold up to 40 equally tiny comic books (sold separately) that depict classic DC Comics covers dating back to even Superman’s original reveal. The tiny comics don’t open to reveal pages inside, but on the back you will find retro-style advertisements to help make your comic book display look even more authentic.